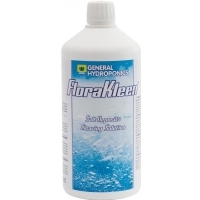 General Hydroponics Flora Kleen is a salt clearing solution that is unique in our industry. FloraKleen is formulated to remove fertilizer residues that can accumulate over time in hydroponic systems, growing media, and potting soils. It is safe for use in all systems and media while plants are growing. It can also be used between crops to clean the systems from accumulated salts. Nourishes the microbial life in the substrate. Unlike other products on the market, it is not enzyme based and uses a completely different technology: Dissolves accumulated mineral salts; Reduces plant stress from excess and imbalanced nutrients; Breaks nutrient bonds that attach fertilizer salts to growing media, also correcting nutrient lock-out. Unlike other products on the market, FloraKleen does not contain enzymes, but uses a completely different technology: Reduces stress due to excess or imbalance of fertilizers by breaking the bonds between the substrate and mineral salts and makes them available to the roots. It also feeds on microbial life of the soil. Use FloraKleen as a final wash a few days before harvest to improve the maturation and the production of sugar. Use FloraKleen 1 or 2 days before harvest, alone or together with Ripen for 3ml/L of water. 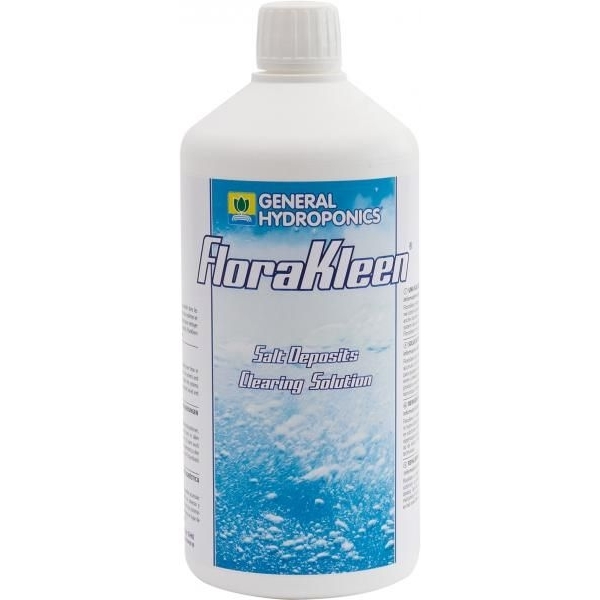 Fill a container with fresh water and add 1.5 - 3 ml/l of FloraKleen. Soak until the water begins to flow from the bottom of the pot. Get back your habitual nutrition program from the following watering. !NOTE: Let Pass 24 hours with FloraKleen only before adding the fertilizers. Between nutrient solution changes: Mix 1,5 to 3 mL per liter of water. Use milder solution for young or fragile plants, stronger solution for older and stronger plants close to harvest. Circulate 48 hours with FloraKleen alone before adding nutrients. Drain old nutrient solution and discard. Refill hydroponic reservoir with fresh water and mix 3 mL of FloraKleen per liter water. Run this solution during last day or two before harvest. Add 3 mL of FloraKleen per liter water during the last 2 days before harvest to increase the sugar level in your crop. Every fifteen days fill a watering can with fresh water and add 1,5 to 3 mL /L ForaKleen. Drench until there is runoff from the bottom of the pot. Resume your regular fertilizer schedule with the next watering.